On those days where there is a bit of snow on the ground, take a look at the roofs around the neighborhood. Sometimes, the way the roof retains snow, or how quickly it melts off, can tell you a lot about the quality of a home’s insulation. 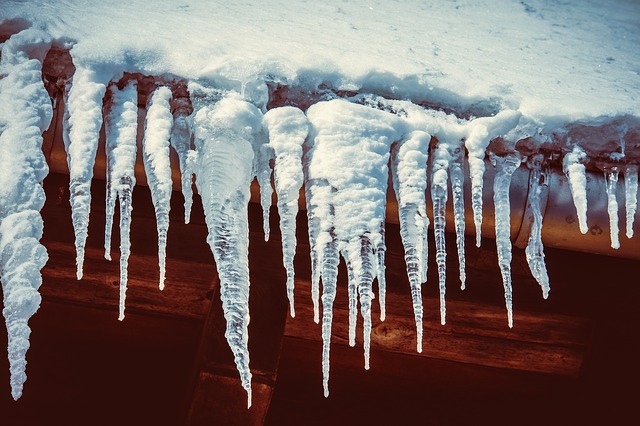 It’s cause for concern if you notice that snow melts off of a roof quickly, or if icicles form in great numbers along the roof. If snowfall melts off of a roof right away, there’s a good chance that there isn’t much insulation in the attic space of the home. What you’re seeing is quite simply the result of the air the homeowner is paying to heat escaping through the roof and melting the snow right off of it. Look for icicles along the roof, as well. These are also signs of snowmelt and, thus, indicators that the insulation might not be in the best shape. Oftentimes, bare patches on an otherwise snowy roof indicate areas where heated air is leaking out of the home. This doesn’t always mean that there’s a serious problem and there are other reasons why snow might melt off of a roof in an uneven way. There might be nearby trees that cast shade on some of the snow, or the snow may have piled up higher on one part of the roof than another. Nonetheless, if you notice that some areas of the roof a completely free of snow when others are covered, it might indicate problems with the house’s energy efficiency. Energy efficiency is a significant concern if you’re looking for property in Smyrna. Houses that are poorly insulated or that have other issues that detract from their energy efficiency could end up being expensive in terms of the money it costs to heat, cool and, most likely, eventually repair those issues. If you’re looking for property, be sure you talk to your Realtor before you make any decisions about the condition of a house. Realtors know what elements of the house need to be inspected, and that knowledge can prevent you from winding up with a house with bad insulation, drafty rooms, and other issues that mean low energy efficiency and higher bills than you should have.